Unlock the Roman keys and solve the ancient puzzle of Chinese tea. For cerebral stimulation, look to the great civilizations that shaped history. 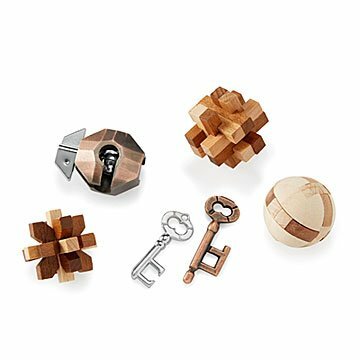 Designed to engage your puzzle-loving mind, this set of brainteasers is inspired by the inventions and achievements of five global civilizations. Sample the mystery of Chinese tea, reverse engineer the Greek water mill, solve the challenge of Egyptian π (Pi), unlock the Roman keys, and try the Aztec passion flower. Part pure puzzle and part cultural exploration, they're coffee table-worthy designs and natural conversation starters. Ages 14+. Made in China. These are great quality, a real challenge. Some are easier than others. I love to have them out on my kitchen island for new people to try! Purchased this set for a secret Santa gift, it was well received. great civilizations puzzles are GREAT! I am always looking for puzzles outside of the confines of a jigsaw puzzle, so these three dimensional wooden puzzles are great. They intrigue the mind, challenge ones' skills, encourage perseverence, and provide utmost satisfaction upon completion. This is the perfect gift for smart kids! It was the hit of the birthday party! Everyone wanted to try the puzzles but with very little success, so the recipient has lots of work ahead of her! I love the box with the history of each gadget and that each one relates to a different civilization in history. All round great gift. Now I have to go back and get myself that "speaker bowl" for my cell phone!! My husband figured out the first two puzzles in a matter of seconds. I had hoped they would be more challenging. Keeping my brother busy during his recovery. He loves to mess with them and show the younger members of our family how to! He's an excellent teacher and the kids love the puzzles as much as he does! Love four puzzles. I got them for my boyfriend for Hanukkah. He wanted puzzles for his office. They slightly challenging (3/5) but I think the real struggle is putting the puzzle pieces back together without instructions. We had to find a You Tube video for one of them.